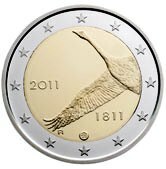 The coin commemorates the 150th anniversary of parliamentary democracy in Finland. 1863 was an important year in Finnish history. Reform pressure in both Finland and Russia led to the Russians allowing the Finnish parliament to meet regularly. This was the start of true transparent democracy in Finland. The use of the Finnish language in the parliament was also now allowed. The coin motive is a very attractive artistic representation of the year 1863. The 6 is shown as a germinating seed – symbolizing the birth of a flourishing democracy if Finland. Around the edge of the inner ring appears SUOMI FINLAND 2103. SUOMI is the Finnish word for Finland. 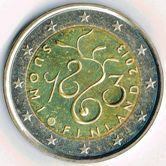 The mint mark, a lion, is shown at around seven o’clock between SUOMI and FINLAND.